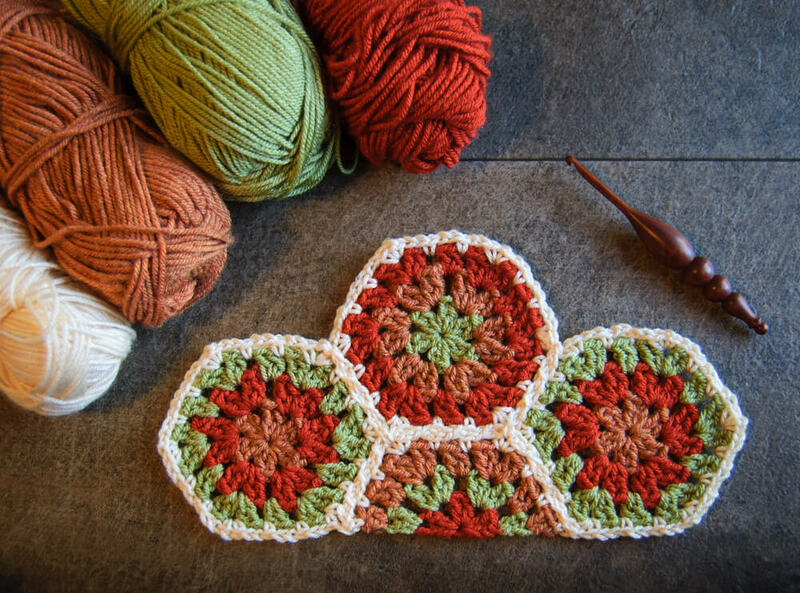 Wondering how to crochet a half hexagon to fill in the large valleys between the full hexagons when making my hexagon crochet blanket? 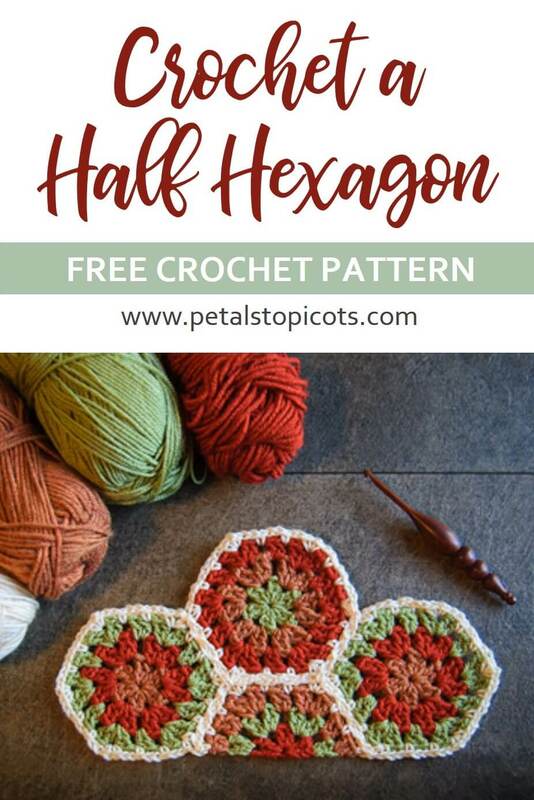 This crochet half hexagon pattern fills in those spaces and creates a nice straight edge to your blanket, as well as any other project you want to use them for. Instead of working in rounds as I did for the full crochet hexagon motifs, the half hexagons are crocheted in rows, without turning so each row is worked with the right side facing you. 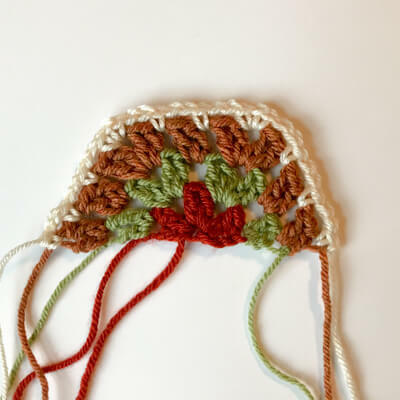 After each row, the yarn is fastened off and the new color is joined in the first stitch. For an extra tidy look, you can replace the beginning chains with standing stitches… they are perfect for these kinds of projects! I used three different colors for each of my hexagons plus a fourth color for joining them, but you can make your hexagons solid or use any color variations you’d like. Row 1: With CA, chain 4 (ch 3 counts as dc), in furthest chain from hook work (1 dc, ch 1, 2 dc, ch 1, 2 dc), fasten off CA, do not turn — 6 dc, 2 ch-1 spaces. 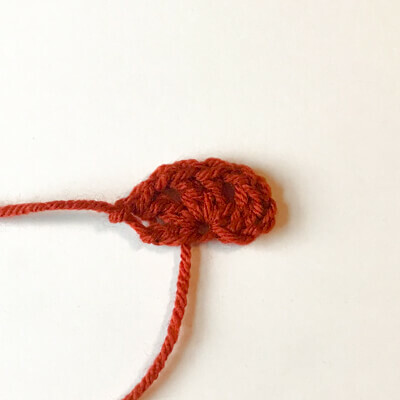 Row 2: Join CB in first stitch (top of beginning ch) of previous row, chain 3 (counts as dc), work 1 dc in same st, *ch 1, work (2 dc, ch 1, 2 dc) in next chain space, repeat from * once more, ch 1, work 2 dc in last stitch, fasten off CB, do not turn — 12 dc, 5 ch spaces. Row 3: Join CC in first stitch (top of beginning ch) of previous row, chain 3 (counts as dc), work 1 dc in same st, *ch 1, work 2 dc in next chain space, ch 1, work (2 dc, ch 1, 2 dc) in next chain space, repeat from * once more, ch 1, work 2 dc in next chain space, ch 1, work 2 dc in last stitch, fasten off CC, do not turn — 18 dc, 8 ch spaces. For my granny hexagon afghan I joined the hexagons on the fourth round using the join as you go method (JAYGO). You can join these half hexagons in the same way or just work this fourth round and seam them together in your preferred method. Row 4: Join CD in first stitch, ch 1, sc in same stitch as join, *ch 2, sc in next chain space, ch 2, sc in next chain space, ch 2, work (1 sc, ch 1, 1 sc), in next chain space, repeat from * once more, ch 2, sc in next chain space, ch 2, sc in next chain space, ch 2, sc in last stitch, fasten off — 12 sc, 11 ch-sp. Voila! That’s it … a nice straight edge for your hexagon project. What about those smaller valleys? 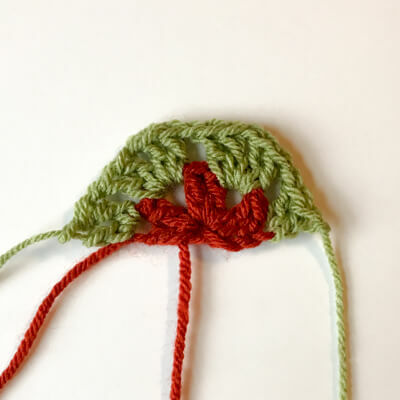 But wait … that covers the half hex sized spaces but you will also notices some smaller triangular spaces along the perpendicular edges of your afghan. 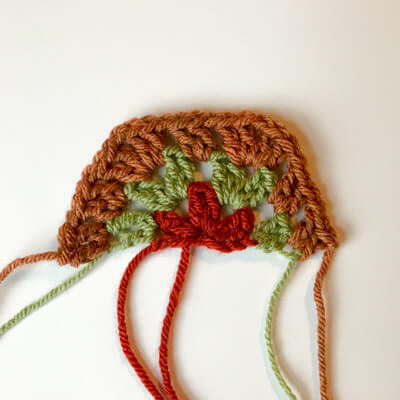 These little valleys make a great decorative edge but if you are looking to square those edges off as well, I designed this granny crochet hexagon edging pattern that fills in those little valleys too. Show off your finished hexagon blankets on Instagram and tag me @petalstopicots.